Custom menus to suit any occasion or event. Bar, dining room or backyard patio buyout options available. Total venue buyout also available. 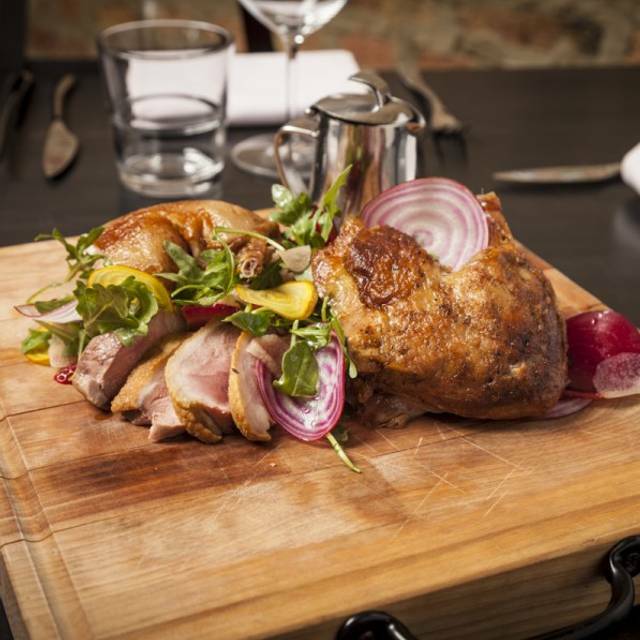 Duck Inn is a Neighborhood Gastro-Tavern & Dining Room situated at Loomis Street and the Chicago River between Chicago’s Pilsen and Bridgeport neighborhoods. Housed in a 100 year old pre-prohibition tavern, it showcases Michelin Rated Partner/Chef Kevin Hickey’s signature New American cuisine. An extensive beverage program filled with craft beers, contemporary cocktails and creative wine service matches the food offerings. 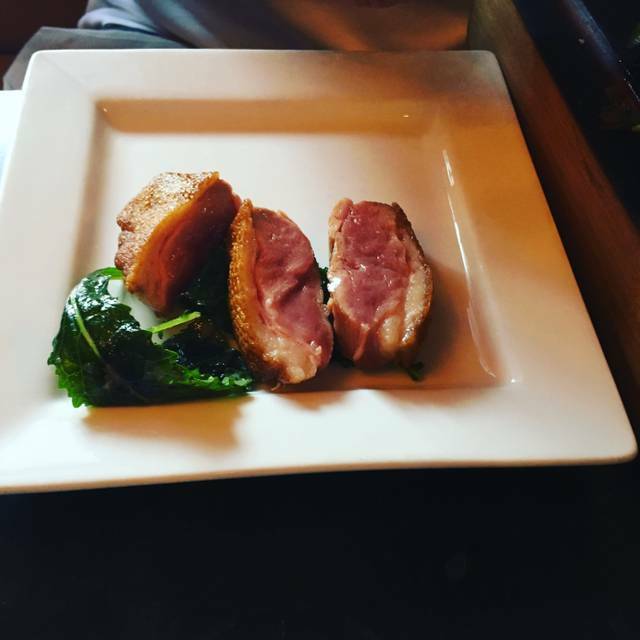 Duck Inn offers small bar and snack menu for the front lounge/bar space and a more traditional menu for the back dining room with first and main courses, a tasting menu and more. Enjoy 50% off for our industry or artist friends. Buttermilk Fried Chicken Thighs, Mashed Potatoes, Biscuit and Collard Greens. Surprises are great, and so is The Duck Inn. As always, best roast duck around. Drinks aren’t cheap but they are very creative and tasty. Ashley is a most wonderful server and made my evening whole! This was our third visit- each time with a different set of dining companions. We were celebrating a job offer and the spirited experience stThe Duck Inn was perfect. We had the escargot on a crepe, the duck dog, and cheese curds to start, then two duck dinners, followed by honey panna cotta for dessert. Great cocktails, beer, and after dinner drinks. Service is fabulous. The only “negative” is the noise level. Otherwise great ambiance. Also easy street parking. Great food and drinks, everything was properly executed. Friendly service and Beth, manager, was welcoming and a joy! Will definitely travel from north side to south side Chicago to visit this gem for brunch or drinks at the patio. I love the inventive menu, the rotisserie duck is perfection and I have enough appetite left to enjoy dessert. This is our 3rd trip to The Duck Inn and after a year of thinking about how great our meal was, this year’s visit did not disappoint. The roast duck is always amazing but on the new Spring Menu, I recommend trying the Buffalo Ricotta Gnocchi and the Panna Cotta. The freeze dried honey provides such a subtle sweet touch to the dessert. See y’all next April! Was in from out of town. Took Uber from local hotel. Food was great. Wait staff friendly. It was a neighborhood feel for this New Yorker. A very enjoyable and creative brunch. Hackney Handshake cocktail highly recommended. Never a bad visit at Duck Inn and this most recent trip was for my birthday. Everything was perfect- from the service to the food to the atmosphere. Thank you Duck Inn! I heard this place was great, and it lived up to its expectations. The drinks were creative, War of The Roses is a vodka drink with egg whites and some other ingredients that made this a great way to start the evening. 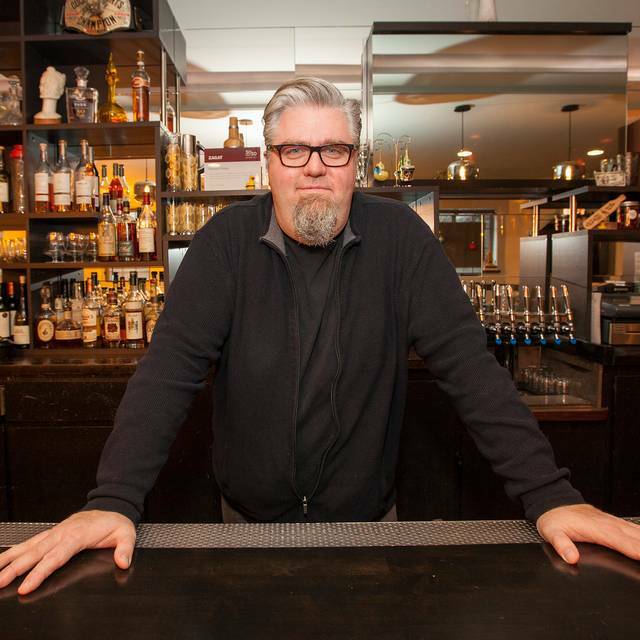 The ambiance is cool and lively, no pretension on the south side. The service was outstanding, everything we ate was fantastic, but the duck, the duck, oh my, it was without a doubt the best I have ever eaten, a memorable dish that does justice to the naming a restaurant after. We shared this with our table of six, but I will return and eat the whole thing by myself. Crisp, moist, flavorful, not too gamey, simply perfection. Really good restaurant! You can smell the duck once you come inside the restaurant. All the choices we made were spectacular. Highly recommended! Team Duck Inn executed everything extremely well. Duck Inn is always terrific, especially when you order the duck! It's all good. 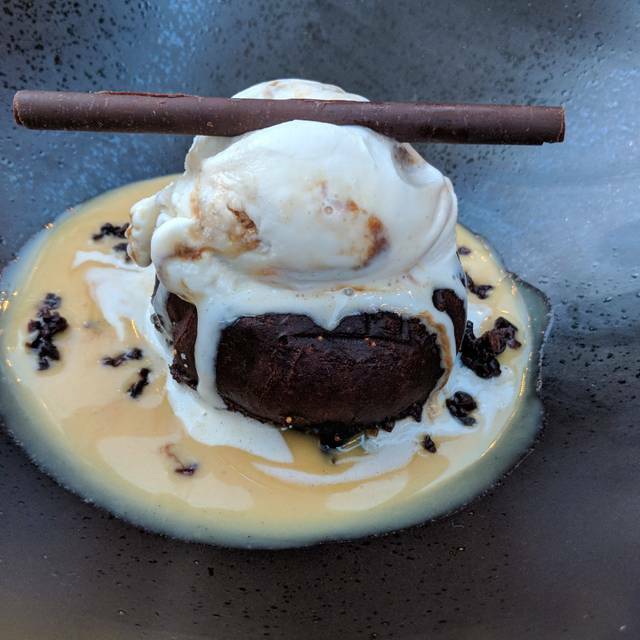 Except that our server neglected to ask us if we wanted dessert. Not that we really needed it but . . .
great food. fun atmosphere . overall a great experience and highly recommendedseemed a little short staffed as drinks took some time and duck came out with meal rather than before as we discussed. 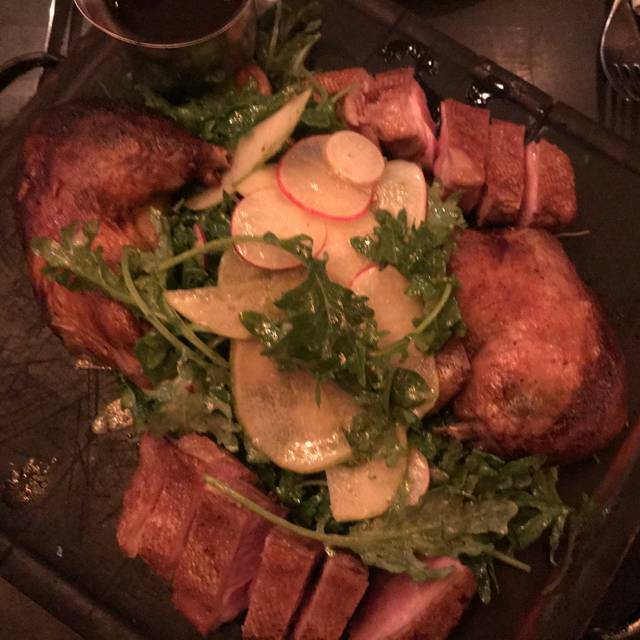 The rotisserie duck IS FREAKIN DELICIOUS and worth EVERY penny! Chef chris brought it out personally and put his heart in that meal! Omg. The brussel sprouts were good, just a smidge salty. The duck wings were ok too, I'm not a huge sweet and savory fan but if u are, then they're a hit! I'll be back for that rotiduck soon! 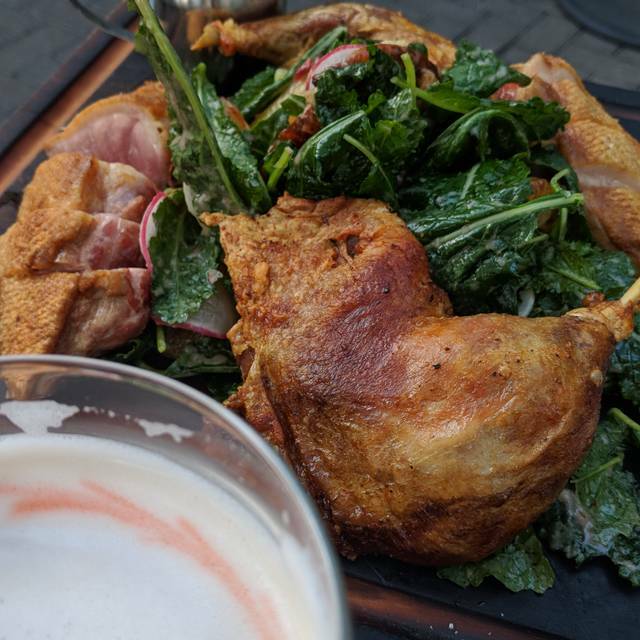 Duck Inn is a neighborhood gem. Amazing food, incredible service, and a slick mid-century retro vibe that is cozy, welcoming and nostalgic. Easily one of my top 5 restaurants in Chicago. Looking forward to going back soon. I love the interior and mid century feeling inside the restaurant. Overall the food was on-point. The highlight was the duck, the dish is prepared very well and the duck breast is cooked to perfection which is difficult to do. 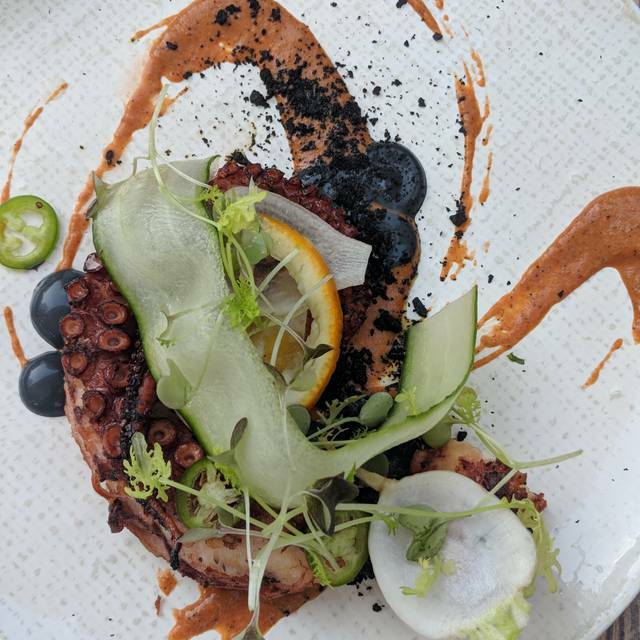 Other highlight dishes were the octopus, brussels sprouts, cheese curds, and tuna (although it feel it was a bit overpriced). I would definitely go back and highly recommend ordering the duck dish and do so in advance to make sure you can get the dish. Celebrating a special occasion, and what a night it was! Our server was gracious and so very accommodating. And the food ... wow! My friends and I had a blast! Thank you. We’ll definitely be back! I requested the Chef’s table when I made a reservation for 6 for dinner. I preordered a Duck for dinner. My husband and I enjoyed a cocktail at the bar while waiting for our friends to arrive. The bartender was engaging and seemed excited to talk to us about the cocktail ingredients. We were promptly seated and it was a fun evening. The other two couples had never been to Duck Inn and were asking us how we came upon such a random place ( I was invited to a party there). The waitress was attentive and enjoyable. The couple seated closest to the the kitchen had fun conversing with the kitchen staff. Our Duck , Brussels sprouts and chocolate peanut butter beignet were delicious. I am never disappointed when we have a meal at Duck Inn. The duck Inn is an amazing gem. The way you are treated and the way the food tastes is incredible. Love that they serve Sparrow Coffee, and other delicious deserts. Excellent service. Our waiter was so helpful with dietary concerns and very friendly. The duck, incredible. Definitely will be back! We had an outstanding evening. The food and service were fantastic. Can’t wait to go back! Great food. The duck was great. Brussel sprouts to die for. Really good atmosphere and great food. Really fun experimental cocktails. This is my 6th or 7th visit but was with 4 newbies and one repeater. It was SOOOO loud on Sat that we couldn't hear each other. We specifically went there to celebrate a Birthday , in a smallish group so we could visit. Didn't really happen. That won't prevent us from going back but we will either ask to be seated in front room where there is more wood to absorb the sound or go on a week night when there may not be as many larger groups. I gave "ambiance" a 4 star because this place is very drafty in the winter. Other than that, you have got to go. Feels like a good old fashioned supper club. Their bar is a site to see and the food/drink menu is exquisite. 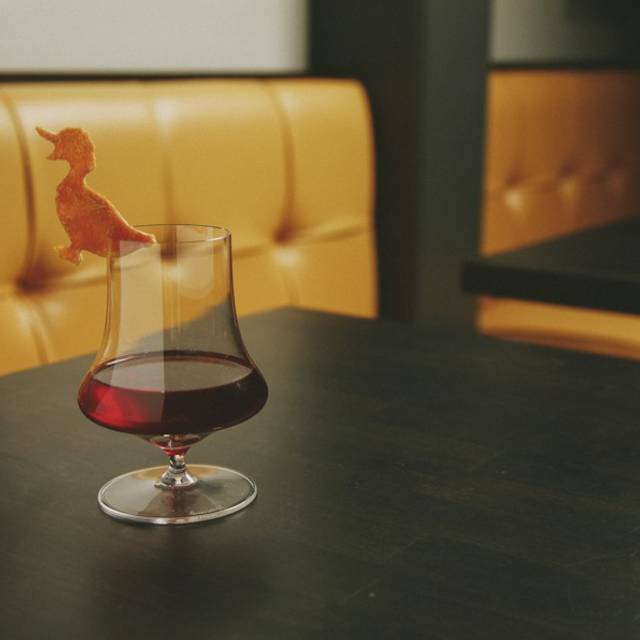 Definitely order the duck beforehand and enjoy many of their great cocktails. Get the brussel sprouts as well, you won't regret it. We made reservations. The entire staff could have been nicer. They didn’t check us...kept us waiting to order and was less than enthusiastic about everything in general. The food was good and we even tried the over the top burger which is off the menu. (It’s an In and Out style burger) Not that the Duck Inn staff would have told us about it, we heard from another chef at another restaurant. The burger was off the charts delicious. 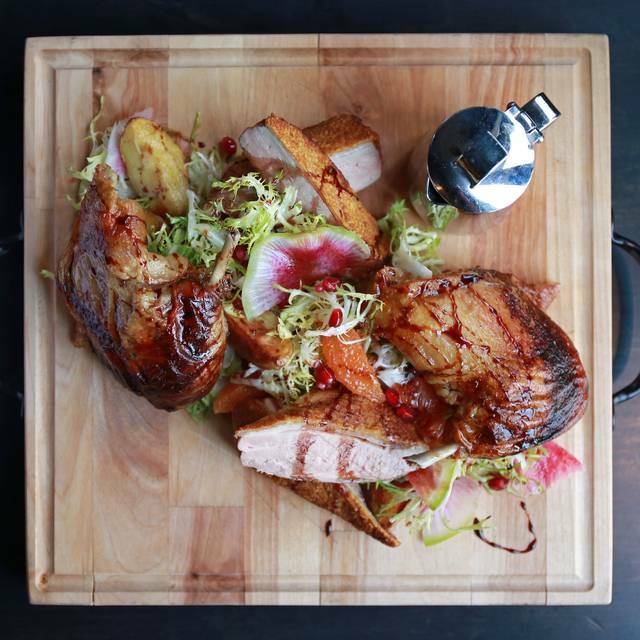 I would love to try the Rotisserie Duck because it looked so good but not sure I want to go back anytime soon. Always a lovely experience. The staff is fun and friendly. Eleanor knew the menu well and helped pick out some excellent choices to include a cocktail I would not have ordered, but really enjoyed. Great food, drinks, and service! Duck Inn is always the best! I would eat here every night if I could. This was my 3rd time and my husband's 1st time at Duck Inn. We were seated at the Chef's table right next to the kitchen, which was super nice to watch. We had ordered the Chef's tasting menu, and it did not disappoint. The Chef himself came out to serve some of the dishes, and they were so delicious. I love that it is a more casual atmosphere, but with top notch beautifully orchestrated dishes that make you feel like you're at Charlie Trotter's or 11 Madison in New York. Super great food. Totally going back and doing the tasting menu again. Appetizers were great-octopus and clams. Split a hamburger sandwich-fabulous. Give Kevin, the bar magician a raise! Great service, great cocktails, great guy. Made a pleasant evening with the wife memorable. Food was great and I really appreciated how attentive they were to dietary restrictions.